The majority of foods that we eat are produced thanks to pollinators, like bees. Do you like blueberries? Chocolate? Squash? Almonds? Vanilla? Thank a pollinator if you said ‘yes’. Bees, butterflies, hummingbirds, beetles, flies; even bats contribute to pollination. 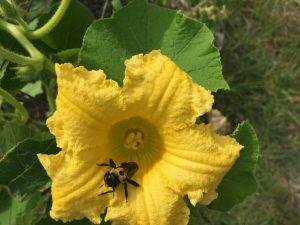 While growers will bring in bee hives during the flowering stage of their crops, you can support agriculture and wildlife by planting for the bees. Bees are very successful scavengers, and plants have evolved with showy flowers to make themselves easy to find. Unlike us, bees see colors in the ultraviolet wavelength. In addition to ultraviolet light, bees’ photoreceptors are most sensitive to the blue and green wavelengths. 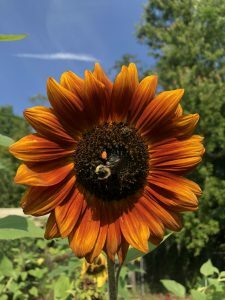 A 2015 study published in Plant Biology determined that bees were not particular about flower color, but the UV patterns within the flower (those wavelengths that the human eye cannot see). So what does that mean for gardeners? Plant a variety of species with high nectar value, unless you have super-human UV vision! Incorporate plants that bloom throughout the year, or multiple species with staggered flowering times so nectar is always abundant. Be tolerant of some damage to plant foliage. The leafcutter bee likes to take pieces of leaves for their nests. Avoid insecticides which will not only harm pests, but our pollinator friends as well. Even insecticides used in lawns, away from your pollinator garden, might be detrimental to ground nesting bees such as the southeastern blueberry bee. While we try to limit the use of standing water to avoid mosquito outbreaks, bees enjoy having access to water. Like us, they are active during the day and need refreshments as temperatures rise. That is why we find them floating in the pool, or sipping from the pet’s water bowl. Bees are wonderful creatures. Without them, our food options would be rather limited. Help them out by planting more nectar-rich flowers, and limiting the use of pesticides in the landscape. Prissy is the UF/IFAS Horticulture Extension Agent for Putnam County. She loves getting her hands dirty, eating local food, swimming, watching Netflix, and felines.